The high throughput and the patented load sensing material feed permit using the machine for various grinding tasks. 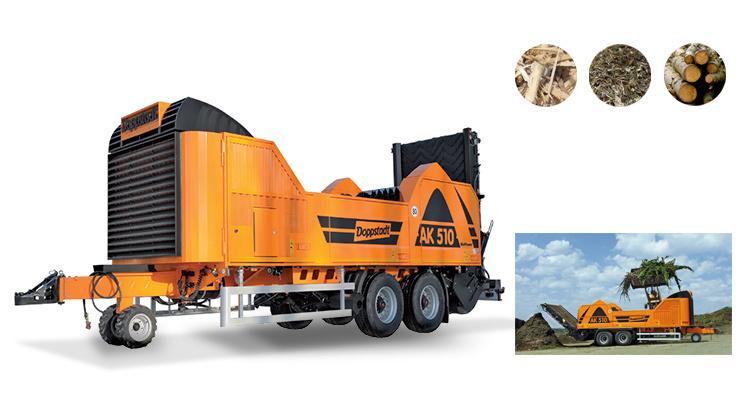 Whatever your application: With the AK you will achieve an optimum and efficient recovery of secondary raw materials. The Doppstadt grinders stand out for their free swinging flail holders with separately replaceable wearing tools and the heavy gyrating mass of the flail drum working at approx. 1,000 rpm. Easy maintenance thanks to large protection doors on all sides and central lubrication. Separate drives for scraper floor and feed-in roller optimizing the material feeding and the throughput. Hydraulic support, controlled without engine power by an electric 24 Volt pump. Short setup times (< 10 min.) thanks to the hydraulically foldable discharge conveyor*, optional magnetic pulley for Fe-separation*.